President Nixon and Chancellor Kurt Kiesinger waving to the crowd in West Berlin. Kurt Georg Kiesinger (German: [ˈkʊʁt ˈɡeːɔʁk ˈkiːzɪŋɐ]; 6 April 1904 – 9 March 1988) was a German politician who served as Chancellor of West Germany from 1 December 1966 to 21 October 1969. Before he became Chancellor he served as Minister President of Baden-Württemberg from 1958 to 1966 and as President of the Federal Council from 1962 to 1963. He was Chairman of the Christian Democratic Union from 1967 to 1971. Kiesinger studied law and worked as a lawyer in Berlin from 1935 to 1940. To avoid conscription, he found work at the Foreign Office in 1940, and became deputy head of the Foreign Office's broadcasting department. During his service at the Foreign Office, he was denounced by two colleagues for his anti-Nazi stance. He had nevertheless joined the Nazi Party in 1933, but remained a largely inactive member. In 1946 he became a member of the Christian Democratic Union. He was elected to the Bundestag in 1949, and was a member of the Bundestag until 1958 and again from 1969 to 1980. He left federal politics for eight years to serve as Minister President of Baden-Württemberg, and subsequently became Chancellor by forming a grand coalition with Willy Brandt's Social Democratic Party. Kiesinger was considered an outstanding orator and mediator, and was dubbed "Silver Tongue." He was an author of poetry and various books, and founded the universities of Konstanz and Ulm as Minister President of Baden-Württemberg. Born in Ebingen, Kingdom of Württemberg (now Baden-Württemberg), Kiesinger studied law in Berlin and worked as a lawyer in Berlin from 1935 to 1940. As a student, he joined the (non-couleur wearing) Roman Catholic corporations K.St.V. Alamannia Tübingen and Askania-Burgundia Berlin. He became a member of the Nazi Party in February 1933, but remained a largely inactive member. In 1940, he was called to arms but avoided mobilization by finding a job in the Foreign Office's broadcasting department, rising quickly to become deputy head of the department from 1943 to 1945 and the department's liaison with the Propaganda Ministry. After the war, he was interned and spent 18 months in the Ludwigsburg camp before being released as a case of mistaken identity. During the controversies of 1966, the magazine Der Spiegel unearthed a Memorandum dated 7 November 1944 (six months before the end of the war in Europe) in which two colleagues denounced to SS chief Heinrich Himmler a conspiracy including Kiesinger that was allegedly propagating defeatism. They accused Kiesinger specifically of hampering anti-Jewish actions within his department. Kiesinger joined the Christian Democratic Union (CDU) in 1946. From 1946 he gave private lessons to law students, and in 1948 he resumed his practice as a lawyer. In 1947 he also became unpaid secretary-general of CDU in Württemberg-Hohenzollern. In the federal election in 1949 he was elected to the Bundestag. In 1951 he became a member of the CDU executive board. During that time, he became known for his rhetorical brilliance, as well as his in-depth knowledge of foreign affairs. However, despite the recognition he enjoyed within the Christian Democrat parliamentary faction, he was passed over during various cabinet reshuffles. Consequently, he decided to switch from federal to state politics. Kiesinger became Minister President of the state of Baden-Württemberg on 17 December 1958, an office in which he served until 1 December 1966. As Minister President he founded two universities, the University of Konstanz and the University of Ulm. In 1966 following the collapse of the existing CDU/CSU-FDP coalition, Kiesinger was elected to replace Ludwig Erhard as Chancellor, heading a new CDU/CSU-SPD alliance. The government formed by Kiesinger remained in power for nearly three years with the SPD leader Willy Brandt as Deputy Federal Chancellor and Foreign Minister. Kiesinger reduced tensions with the Soviet bloc nations establishing diplomatic relations with Czechoslovakia, Romania and Yugoslavia but he opposed any major conciliatory moves. A number of progressive reforms were also realised during Kiesinger's time as Chancellor. Pension coverage was extended in 1967 via the abolition of the income-ceiling for compulsory membership. In education, student grants were introduced, together with a university building programme, while a constitutional reform of 1969 empowered the federal government to be involved with the Länder in educational planning through joint planning commission. Vocational training legislation was also introduced, while a reorganisation of unemployment insurance promoted retraining schemes, counselling and advice services and job creation places. In addition, under the “Lohnfortzahlunggesetz” of 1969, employers had to pay all employees’ wages for the first 6 weeks of sickness. In August 1969, the Landabgaberente (a higher special pension for farmers willing to cede farms that were unprofitable according to certain criteria) was introduced. One of his low points as Chancellor was in 1968 when Nazi-hunter Beate Klarsfeld, who campaigned with her husband Serge Klarsfeld against Nazi criminals, publicly slapped him in the face during the 1968 Christian Democrat convention, while calling him a Nazi. She did so in French and - whilst being dragged out of the room by two ushers - repeated her words in German saying "Kiesinger! Nazi! Abtreten!" ("Kiesinger! Nazi! Step down!") Kiesinger, holding his left cheek, did not respond. Up to his death he refused to comment on the incident and in other opportunities he denied explicitly that he had been opportunistic by joining the NSDAP in 1933 (although he admitted to joining the German Foreign Ministry to dodge his 1940 draft by the Wehrmacht). During his period as Chancellor, he made Carl Schmitt his regular intellectual companion (also a 1933 NSDAP late-joiner). Other prominent critics included the writers Heinrich Böll and Günter Grass (in 1966, Grass had written an open letter urging Kiesinger not to accept the chancellorship). After the election of 1969, the SPD preferred to form a coalition with the FDP, ending the uninterrupted post-war reign of the CDU chancellors. 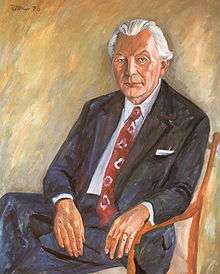 Kiesinger was succeeded as Chancellor by Willy Brandt. Kiesinger continued to head the CDU/CSU in opposition until July 1971 and remained a member of the Bundestag until 1980. Of his memoirs only part one (Dark and Bright Years) was completed, covering the years up to 1958. He died in Tübingen. After a requiem mass in Stuttgart's St. Eberhard Church, his funeral procession was followed by protesters (mainly students) who wanted his former membership in the Nazi Party remembered. 2 April 1968 - Ernst Benda (CDU) succeeds Lücke as Minister of the Interior. 16 October 1968 - Aenne Brauksiepe (CDU) succeeds Heck as Minister of Family and Youth. Erhard Eppler (SPD) succeeds Wischnewski as Minister of Economic Cooperation. 7 February 1969 - Heinrich Windelen (CDU) succeeds von Hassel as Minister of Displaced Persons, Refugees, and War Victims after the latter was elected to President of the Bundestag. 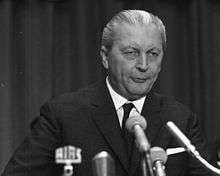 26 March 1969 - Horst Ehmke (SPD) succeeds Heinemann as Minister of Justice after the latter was elected to 5th President of Germany. ↑ Jeffrey Herf, "Judenhass aus dem Äther. NS-Propaganda für die Arabische Welt während des Zweiten Weltkriegs", in Naziverbrechen. Täter, Taten, Bewältigungsversuche, edited by Martin Cüppers et al., Darmstadt 2013, pp. 45-61, here p. 49. ↑ Agricultural policy in Germany. Organisation for Economic Co-operation and Development. 1974-01-01. ISBN 9789264112834. ↑ Flora, Peter (1986-01-01). Growth to Limits: The Western European Welfare States Since World War II. Walter de Gruyter. ISBN 9783110111330. Wikimedia Commons has media related to Kurt Georg Kiesinger. Philipp Gassert: Kurt Georg Kiesinger 1904–1988. Kanzler zwischen den Zeiten. DVA, München 2006, ISBN 3-421-05824-5 (Rezension Daniela Münkler und Benjamin Obermüller, rezensionen.ch, 19. Juli 2006, S. 31). Michael F. Feldkamp: Katholischer Studentenverein Askania-Burgundia im Kartellverband Katholischer Deutscher Studentenvereine (KV) zu Berlin 1853–2003. (PDF) Eine Festschrift herausgegeben von der K.St.V. Askania-Burgundia, Berlin 2006. Otto Rundel: Kurt Georg Kiesinger. Sein Leben und sein politisches Wirken. Kohlhammer, Stuttgart 2006, ISBN 3-17-019341-4. Günter Buchstab, Philipp Gassert, Peter Thaddäus Lang (Hrsg. ): Kurt Georg Kiesinger 1904–1988. Von Ebingen ins Kanzleramt. Herder, Freiburg 2005, im Auftrag der Konrad-Adenauer-Stiftung, ISBN 3-451-23006-2. Reinhard Schmoeckel, Bruno Kaiser: Die vergessene Regierung. Die große Koalition 1966–1969 und ihre langfristigen Wirkungen. Bouvier Verlag, Bonn 2005, ISBN 3-416-02246-7. Albrecht Ernst: Kurt Georg Kiesinger 1904–1988. Rechtslehrer, Ministerpräsident, Bundeskanzler. Begleitbuch zur Wanderausstellung des Hauptstaatsarchivs Stuttgart, Stuttgart 2004, ISBN 3-00-013719-X. Joachim Samuel Eichhorn: Durch alle Klippen hindurch zum Erfolg: Die Regierungspraxis der ersten Großen Koalition (1966–1969) (Studien zur Zeitgeschichte, Band 79); München 2009.